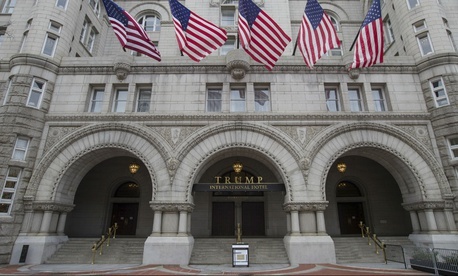 Two years into the Trump administration, “interactions” between lobbyists, government officials and Trump businesses have topped 1,400, according to a study released late last month from the nonprofit Citizens for Responsibility and Ethics in Washington. Tallied mostly from news accounts, public documents and social media mentions of visits to Trump-owned properties, the report specifically listed 119 such visits from agency officials—a list of which was provided to Government Executive. The study tracks President Trump’s own visits to such properties as Palm Beach, Fla.-based Mar-a-Lago, his Bedminster, N.J., golf club and Washington’s Trump International Hotel. “Officials’ visits to his properties have led to Trump profiting at taxpayer expense, as state and federal funds are paid to Trump businesses to cover various aspects of his visits or the visits of state and federal officials to his properties,” the report argued. CREW identified 12 foreign governments that have made payments to Trump properties during his first two years in office—the type of behavior that is at the center of litigation over whether Trump’s retention of ownership in his business empire is a violation of the Constitution’s foreign emoluments clause. Some of the federal officials mentioned are at the Cabinet level. For example, in March 2018, the American Petroleum Institute held an annual meeting at Trump International Hotel, attended by then-Interior Secretary Ryan Zinke and Energy Secretary Rick Perry. In September, the conservative American Legislative Exchange Council held a gala at the Washington hotel attended by Vice President Mike Pence, Counselor to the President Kellyanne Conway, Zinke, and Homeland Security Secretary Kirstjen Nielsen. Out of 186 total recorded visits by executive officials to Trump properties during Trump’s second year, the vast majority—145 of them—were to the Trump International Hotel in Washington, D.C., where book signings and other events hosted by Trump affiliates frequently drew crowds of administration insiders, CREW wrote. The list of individuals, provided on an Excel file, includes visits, for example, by Commerce Department General Counsel Peter Davidson; Deputy Assistant Defense Secretary for South and Southeast Asia Joseph Felter; Health and Human Services Department Adviser Junanita Balenger; and Commodity Futures Trading Commission Director of the Swap Dealer and Intermediary Oversight Division Matthew Kulkin.